Dentistry is more than a profession. It is a calling. One patient and one dentist at a time, we help to build neighborhoods and communities, cities and states, and ultimately a nation and world of healthier, happier citizens, many of whom enjoy the blessing of taking good oral health for granted. But oral health is not a given, and far too many of our neighbors and fellow citizens do not yet have access to quality, affordable dental care. Millions of people still avoid seeing a dentist out of fear. Millions more stay away because they don’t have the necessary funds for dental care or because they lack a basic knowledge of how important regular dental visits are to maintaining overall health and a quality lifestyle. 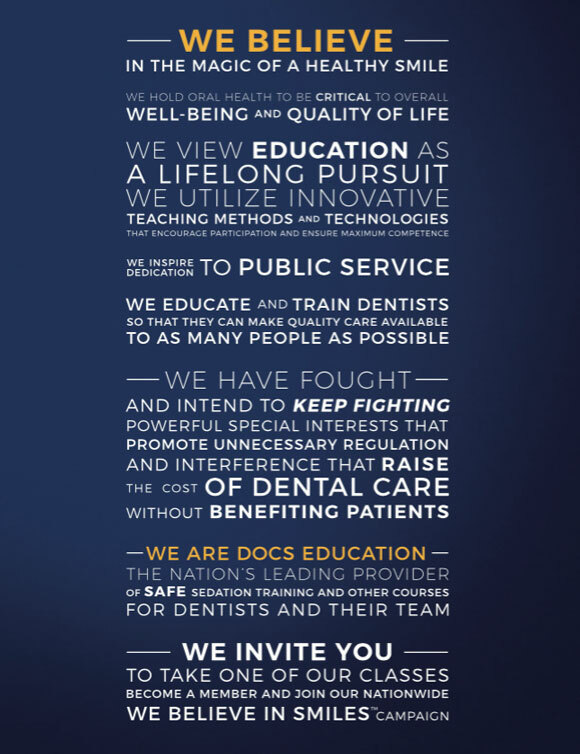 Beginning on Day One in 1999, when Dr. Tony Feck and I founded DOCS Education, it was our vision to break down the barriers that prevent people from seeing a dentist and receiving the quality of care that enriches lives… And nations. We proclaimed our belief in the magic of a healthy smile, and that canon has been at the core of our corporate being every day since. Helping patients regain and maintain their healthy smiles is what drives Tony, me – and every one of our DOCS Education colleagues – to educate our profession, and the public at large, on the gospel of oral health. Accompanying this essay is our DOCS Education Proclamation. More than a mission statement, it affirms who we are, how we see the world, why we do what we do, and what we strive to accomplish. It concludes with an invitation to join our "We Believe in Smiles™" campaign. Half a dozen years before DOCS Education was founded, I was caught off guard at the way the words spoken in a light-hearted film comedy, Dave, struck me so profoundly. In the movie, the lead character, Dave Kovic, played by Kevin Kline, runs a temporary employment agency. Dave also happens to be a dead ringer for the President of the United States. When the real President suffers a massive stroke, his White House aides enlist Dave – with comic consequences – to stand in. "If you’ve ever seen the look on somebody’s face the day they finally overcome their fear and restore their oral health and smile, I’ve had some experience with this; they look like they could fly… And if one person could start to feel this way, and then another person, and then another person, soon all these other problems may not seem so impossible. You really don’t know how much you can do until you stand up and decide to try." Indeed, much like the fictional Dave, we live in a troubled, contentious time. Many of us feel limited in our ability to make a meaningful difference. Yet, we at DOCS Education "have some experience with this," and know that smiles are viral. It’s only one of the reasons that they are magical, and we believe in them wholeheartedly. When our nation is so polarized, our ability to beam a smile at one another seems the perfect first step toward a much-needed national healing and rapprochement. In 1993, Prince Rogers Nelson, known simply as Prince by the late musician’s millions of adoring fans, legally changed his name to a glyph – which became known as The Love Symbol. Prince’s glyph was an amalgam of graphic metaphors, featuring astrological symbols for male and female intertwined in a shape that looked like a scepter. Words alone were inadequate to convey all of the meaning embodied in The Love Symbol, which rapidly became – and remains to this day – one of the most-recognized brands in the world. Yet as symbols go, Prince’s glyph was a featherweight compared to the universal message expressed in a sincere, free, full, warm, and healthy smile. Smiles are magic. They convey volumes about the smilers, their self-esteem, the state of their health, their sense of belonging, and the state of their world. Healthy smiles are magic because they are both personal and universal. The act of a simple smile has launched hundreds of millions of romantic relationships. Smiles have made untold numbers of strangers feel welcome; have helped salespeople close trillions of dollars of sales; and have punctuated infinite celebrations of success, both grand and minute. Healthy smiles, too, are an outward sign of good health. Science has demonstrated, convincingly, that as our oral health goes, so goes our physical well-being. A healthy mouth helps protect us from cancer, heart disease, arthritis, pregnancy complications, and even erectile dysfunction. A healthy smile is color blind, knows no nationality, has no age restrictions, requires no special training, and is unbound to any political party or philosophy. All things considered, it’s not hard to understand why we are ardent believers in the magic of a healthy smile. When it comes to preventable and curable pain, there is nothing in life to compare to the agonies of severe tooth pain, periodontal disease, rampant caries, oral ulcers and lesions, and craniofacial anomalies. Those with missing teeth, sensitive teeth, malocclusions or compromised periodontium are unable to adequately chew their food, much less enjoy health eating (think apples, raw vegetables, and nuts). We know patients, who out of fear of the dentist or due to poverty, haven’t smiled in decades because they are so embarrassed about the appearance of their teeth – and gums. It’s their son’s or daughter’s wedding, and they are stoic. It’s their own wedding anniversary, and they are close-lipped. The birth of a grandchild, a job promotion, a state-championship, a beautiful sunny day – it doesn’t matter. Those with painful mouths and ugly teeth won’t express how they feel with a smile. As for the impact that poor oral health has on overall physical health, I’ve already noted some of the serious health problems that can be sparked due to dental neglect. But the illness connection runs in both directions. Poor oral health has been found to lower the body’s resistance to infection, thus exacerbating certain diseases, including diabetes, osteoporosis, hypertension, Alzheimer’s, and HIV/AIDS. The cost to patients who don’t care for their oral health – and to society which must foot the exorbitant bills for many of the associated illnesses – is incalculable. As dentists and oral health providers, we can be the first line of defense to protect the well-being and quality-of-life of members of our community. Our role is critical. Although dentists seldom get the credit we deserve, we have been medical and health innovators for more than 175 years. The world’s first dental school was founded back in 1840. It was two dentists who in 1844 and 1846, respectively, introduced nitrous oxide and then ether anesthesia to the world. The American Dental Association, a global leader in education, was formed in 1859 – 158 years ago. Closer to home, DOCS Education has trained more than 20,000 dentists plus members of their teams in safe dental techniques, most notably sedation dentistry. Once a little-known, seldom-used method of treating fearful and anxious patients, oral sedation has become mainstream, attracting more than 20 million – yes, million – dental patients, the vast majority of whom would have avoided the dentist altogether were it not for this breakthrough, safe, patient-friendly treatment. We at DOCS Education take pride in the significant role we’ve played in educating dentists, relying on innovative teaching methods and technologies available nowhere else. Dentists who attend our courses consistently report they are the best, and most effective, continuing education classes they’ve ever taken. That’s not bragging or boastfulness, it’s a simple truth. Our interactive teaching methods, devised and continually refined by a dedicated faculty that knows no equal, encourages the active participation of our students and ensures maximum retention and competence. DOCS Education graduates not only remember what they learned in our courses; they leave confident of their ability to incorporate their knowledge into their daily practice. We, too, are lifelong learners. Each year, we immerse ourselves in the latest dental research and clinical evidence to stay fresh and revise our curriculum as needed. Moreover, we are also students of education technique. When there is a new, better way to transmit oral health knowledge to our course participants, we quickly embrace it. Our promise is always to be on the cutting edge of dental education. At the top of this essay, I wrote that dentistry is more than a profession, it is a calling. To us at DOCS Education, that is a truism that we are dedicated to sharing with each and every one of our students. We must always – always, serve our patients and their highest needs before we serve ourselves. One example is our annual Sedation Safety Week, which will mark its ninth anniversary in the spring of 2017. Each year, we host a week of free nationwide learning and activities designed to remind dentists – both DOCS Education members and others – of the vital importance of staying atop all safety procedures. Safe Sedation Week is also an opportunity to educate fearful and anxious patients of the newest, pain-free, anxiety-free treatments available to them. Each year, DOCS Education provides course scholarships and grants to dentists who work in community clinics, the military, or dedicate a significant number of hours to providing pro-bono services. Later in 2017, we intend to announce an additional scholarship program – named for a pioneering dental educator and practitioner – designed to help even more dentists acquire the additional training they need to safely and effectively treat fearful and anxious patients. It might surprise many people, dentists included, that the dental profession is one of the 10 Most Trusted Professions in the United States. In fact, the most recent Gallup poll ranks dentist as the 5th most-trusted profession in the country, ahead of college professors, HMO managers, state governors, and even clergy. With trust as its foundation, the dental profession was ranked #1 by U.S. News in January 2017 at the top of the magazine’s annual "The 100 Best Jobs" in the United States. That comes as no surprise to us. We offer training, and thousands upon thousands of dentists – both veterans and rookies – take our courses, because of a collective desire to make quality care available to as many people as possible. Ours is a partnership of sorts, wherein we design and deliver courses and dentists and their team members make the investment of their time and tuition to buttress their continuing education. From our vantage point, we see what we believe is a significantly higher percentage of our course graduates engaged in pro-bono and reduced-rate dentistry for patients who require it than those individuals in the at-large dental population. Whether we simply tend to attract a pool of already-dedicated dentists or whether we help to inspire them, I can’t say with certainty. But we are proud of the dedication our graduates demonstrate to selflessly serving the needs of their communities. As many dentists know, in 2016, DOCS Education was one of the most outspoken opponents to Resolution 37, a proposal brought before delegates to the American Dental Association’s annual meeting concerning the ADA’s guidelines for sedation dentistry. It was a long and expensive battle, that unfortunately we lost by a slim margin. Our opposition to Resolution 37 was grounded in our conviction that the new guidelines – which require many more hours of expensive training for sedation dentists – were unnecessary to protect patients, but will raise the cost of providing sedation dental care significantly. The ADA did not provide a scintilla of scientific evidence to show that increasing the hours of training would increase safety to patients. We have always fought and intend to keep fighting to keep the cost of dentistry affordable. While DOCS Education is a for-profit company, our strong opposition to Resolution 37 reflects our deeply held commitment to put patients ahead of profits. How? Because the additional educational requirements now adopted by the ADA will mean more and more dentists will be compelled to come to our courses, and our profits will rise concomitantly. We strenuously fought Resolution 37 knowing full well that for our company – but not for our profession and the public at large – the new guidelines would be profitable. In the end, however, I must confess that my business philosophy is, "Anything that harms our patients, and our dental colleagues, will also ultimately harm our business." Charles E. Wilson, the late president of General Motors, famously declared in 1952 that what was good for America was good for GM. We at DOCS Education see it similarly. What is good for patients is good for our company. Resolution 37 – now the official policy of the ADA – is not beneficial to patients; quite the contrary. We are pledged, state-by-state, and at all future ADA conferences, to seek to limit or reverse the damaging impact of Resolution 37 and any similar future punitive guideline proposals or harmful state regulations. Good public oral health is a participatory movement; it’s not enough to sit at your desk and cheer on the concept. So, we invite you and your colleagues to join us as we collectively pursue the dream of reaching a day when no patient who wishes to receive effective dental care is turned away because he or she can’t afford to seek treatment. Likewise, patients should never have to avoid seeing a dentist because they are afraid or because they harbor memories of an unpleasant prior visit. Safe sedation dentistry, as we teach and preach it, makes such fears a thing of the past. We are DOCS Education, the nation’s leading provider of safe sedation training and other expert courses for dentists and their team. We believe in the magic of a healthy smile.